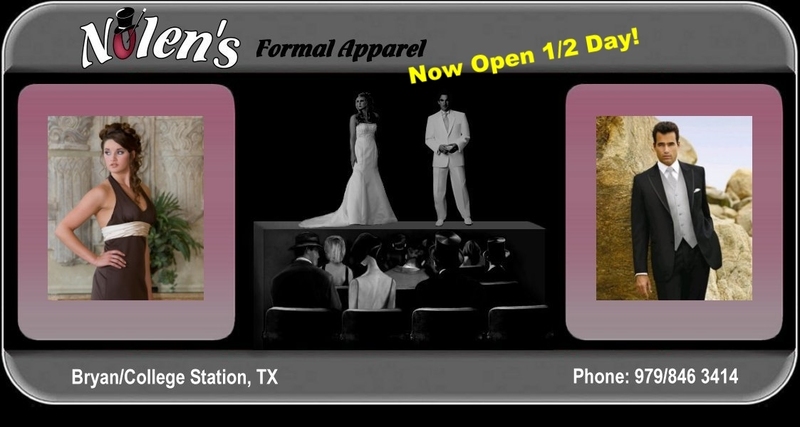 Nolen's has been renting tuxedos in Central Texas for many years. We can help with a tuxedo purchase or a tuxedo rental for the next wedding or prom Brenham. Nolen's also serves all of Central Texas including Waco, Brenham and Austin, TX. It is your Central Texas outlet for some of the finest designer brand tuxedos like FUBU, After Six, Jean Yves, Calvin Klein, Ralph Lauren, Perry Ellis, Oscar De La Renta, Mossy Oak and Ecko. We are known for handling only the finest in men's formal wear. For that out of town event, we can supply Ascot tuxedos. Let our professional men's formalwear staff help by fitting you with a tuxedo for your next formal event. So weather your formal event is a wedding, prom, Quinceanera or any other special occasion, Nolen's is the place for your tuxedo rental, or purchase. If you live in Caldwell, Brenham, or any other city in Central Texas, and are looking for the a tuxedo rental for a wedding or prom, Nolen's is the place to go! This page originated from b4apechio.